WING SPAN 27 FEET 8.2 m.
WING AREA 122 SQ.FT. 11.4 m.sq. LENGTH 20 Ft. 11 In. 6.38 m.
HEIGHT (rudder tip) 8 Ft. 7 In. 2.6 m.
EMPTY WEIGHT 580 LBS. 263 kg. GROSS WEIGHT 1,100 LBS. 500 kg. USEFUL LOAD 520 LBS. 236 kg. CABIN WIDTH (shoulders) 40 INCHES 100 cm. CABIN WIDTH (optional bubble doors) 44 INCHES 110 cm. ENDURANCE 4.6 Hrs. 4.6 Hrs. 4.1 Hrs. 4.1 Hrs. Range and endurance figures are quoted with no fuel reserve. Figures are based on factory prototype results, and are given at standard atmosphere, sea level, no wind, unless otherwise indicated. All technical data, specification and performance figures subject to change without notice. * TAS is indicated airspeed corrected for temperature and altitude. The corrections are approximate. Engine Limitations: 50 - 100 hp, up to 185 lbs. installed. Alternative engines will affect performance, specifications and flight characteristics of the aircraft. Also, the weight and balance of the aircraft may be adversely affected by alternative engines, and the original fuel system may not be adequate or suitable for some engines. Most alternative engines will require a custom engine mount and engine cowl. Zenith Aircraft Company does not manufacture or directly support engines. Click here to view flight demonstrations of the STOL CH 701's outstanding short take-off and landing (STOL) performance (video clips). 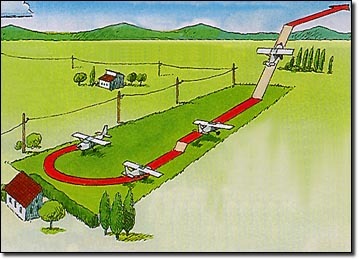 True short take-off and landing capability for the serious sport pilot. "You're already where you want to be!"